The Young Kennel Club (YKC) has announced the winners of its tenth annual YKC Artist of the Year competition which will be showcased at the world’s greatest dog event, Crufts 2018. The popular annual art competition invited talented YKC members to design the front cover of the YKC Crufts catalogue. Members were encouraged to get creative and submit their design within the theme ‘head and shoulders above the rest – a dog portrait’. This theme meant that the dog/dogs should be the main subject in the design, with either just the head or the entire body of the dog standing, lying or sitting down. The creativity and talent of entries impressed the judges, but the member who won the judges over to be crowned the overall winner was eighteen year-old Sarah McLaughlin from Littleport, Cambridgeshire. 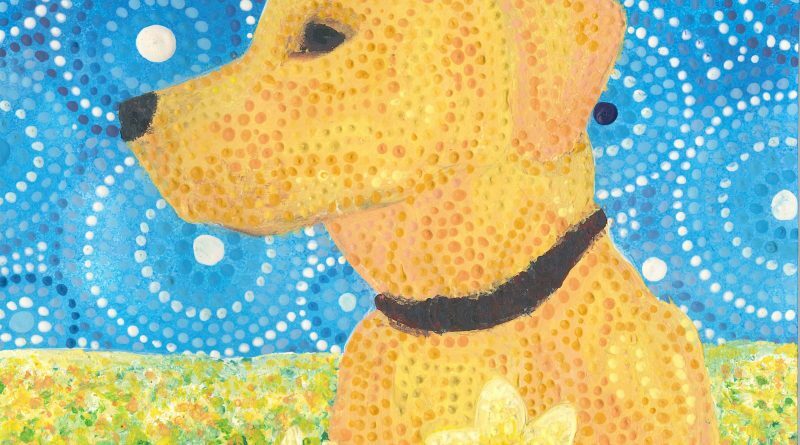 Sarah, who has been a YKC member for five years, based her painting on a photo she took of her eight year-old Labrador, Max in the family garden last spring. She is currently in her first year at Durham University studying geography. Living over 200 miles away from Max has been hard for Sarah but she plans on continuing competing in fun dogs shows with him over the holidays. This year’s competition was judged by the YKC team in London. The judges were looking for a striking cover design that was well executed, had an imaginative concept and clearly met the brief. 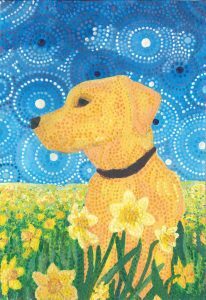 Sarah, Chloe and Daisy’s art work will be on display at Crufts from 8th – 11th March on the YKC stand adjacent to the YKC ring in Hall 3 of the NEC, Birmingham. The YKC Crufts catalogue will showcase all members who are competing in the YKC ring at Crufts 2018, and will be available at the show. Alongside having her artwork featured on the cover of the catalogue, Sarah will receive £75, art supplies and a year’s free YKC membership. Chloe also wins £50 and art supplies and Daisy will receive £30 plus art supplies.